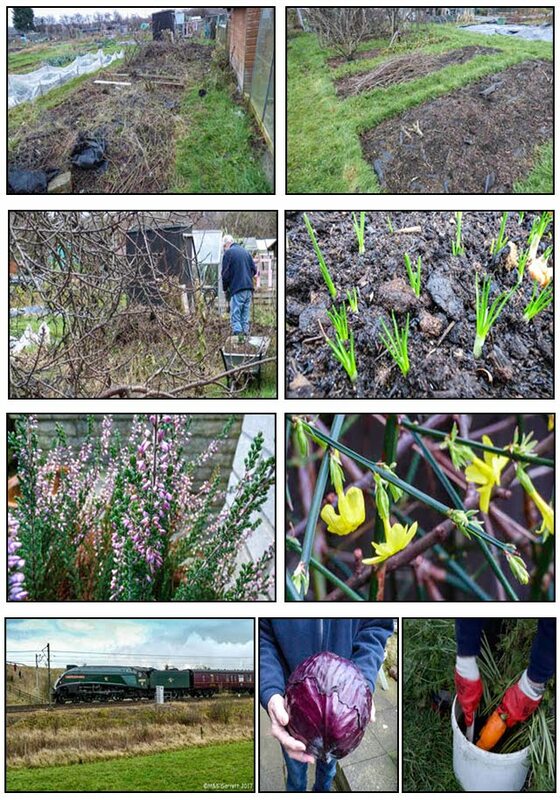 On Saturday we had intended to make an overdue visit to the plot but instead we filled our day with other garden related activities. The morning was spent at a local garden centre's mini potato day. Martyn has posted a video here. Each year we choose half a dozen varieties of potatoes that we haven't grown before as a trial. To be honest we didn't expect there to be many new varieties to try out but we were wrong. The six new varieties that we chose were Jazzy, Elfe, Carlingford, Mayan Gold, Carolus and Apache. We bought four seed potatoes of each. We then added bags of the potatoes that we wanted to grow in larger quantities. These were based on varieties that had impressed us in previous years, some of which were from last year's trial. We chose seven varieties for our main potato crop Casablanca, Rooster, Vivaldi, Osprey, Cara, Kestrel and Nadine. 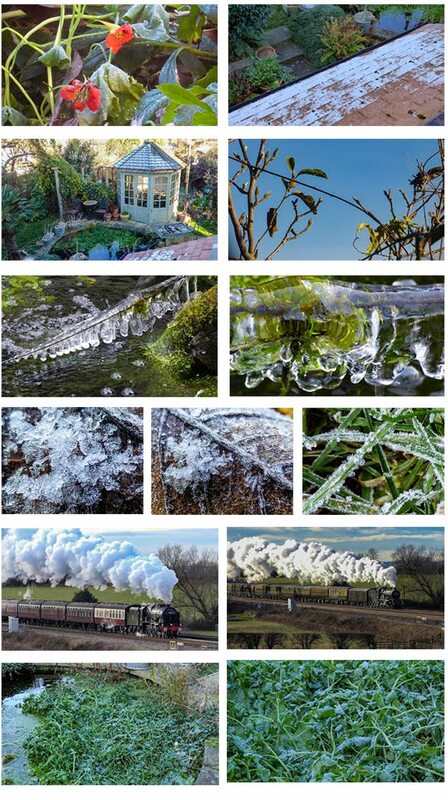 Martyn has posted more about each variety here. In the afternoon Martyn tidied up and cleaned out the summer house and set out the potatoes to chit. I tidied up a couple of perennial borders in the back garden. 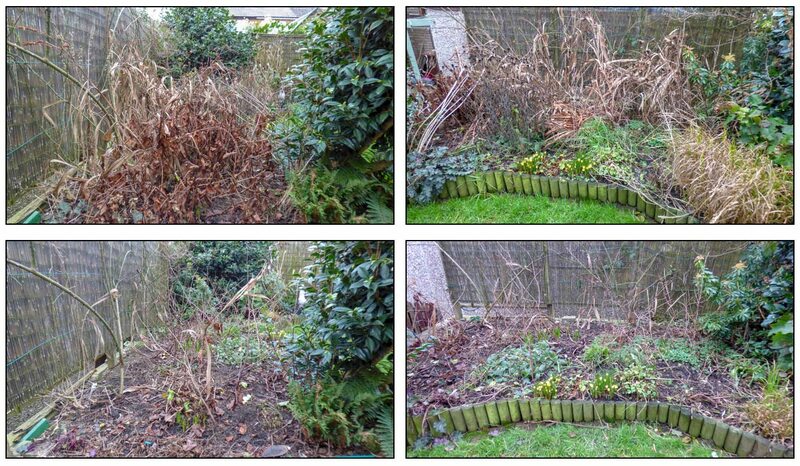 It was mainly a case of cutting back the dead growth from the perennials. We now have several bags of debris to transport to the compost bins at the allotment. We were intended a plot visit today but guess what - it's raining! Once that first seed order appears at the doorway it seems that the new growing season is steadily starting to nudge its way to the forefront of our minds. That event occurred last week when our main seed order was delivered. A few more seeds are likely to follow as we always seem to think of something else at a later date, in fact there are already things on my subsidiary list. This weekend one of our local garden centres will be holding their mini potato day which we hope to visit. It's an opportunity to buy individual seed potatoes which we can trial as potential new varieties. We were intending to head for the plot on Tuesday but instead we decided to do some work in the garden. Martyn headed into the greenhouse to start on some general tidying up. He posted a video here. My job was to cut back the perennials in the front garden bed. I always wait until the are signs of the bulbs pushing through before doing this. 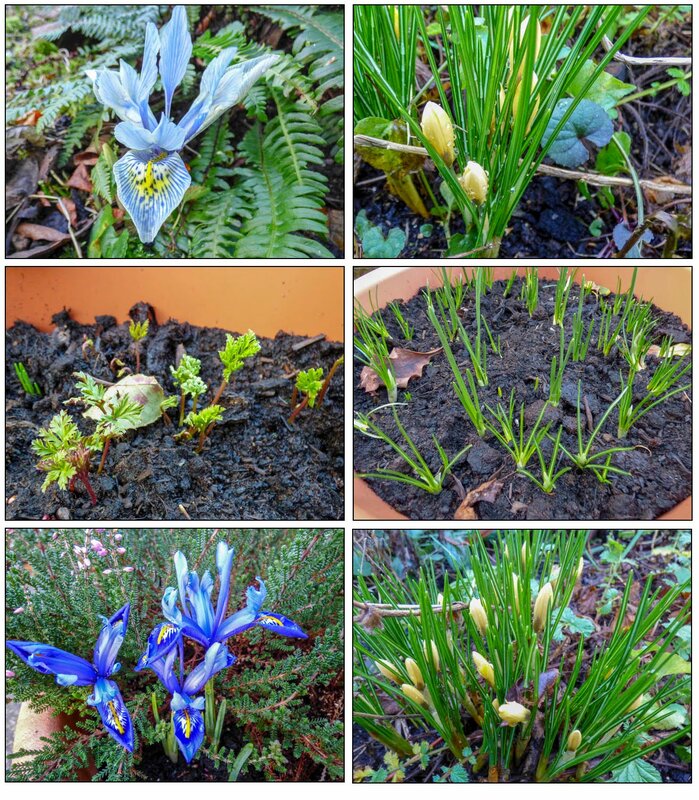 I had noticed plenty of emerging shoots and so the time was right to give them some breathing space. 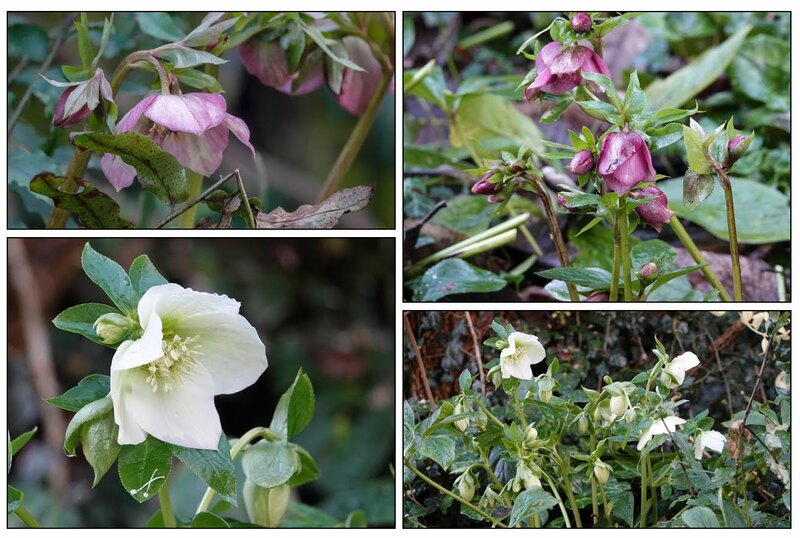 The previous weekend I had cut back the leaves of the hellebores in our shady bed . The leaves from the magnolia will be left to decay naturally. Not only have the hellebores started to flower but clumps of snowdrops were starting to show buds and would have been lost beneath the leaf cover. Bulbs are not the only things to start to be impatient to shine. The sarcococca in a tub on the patio is in full flower. We now need a still and sunny day so we can appreciate its perfume. 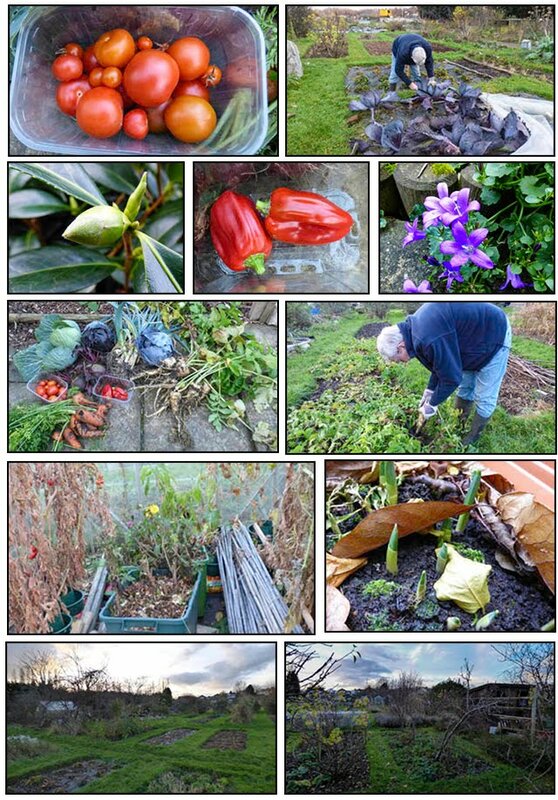 There's been little opportunity for outdoor gardening over the last couple of weeks. The weather hasn't tempted us outdoors even though there are jobs aching to be tackled. Our main seed order has been sent off but there are always a few additions to be made. New ideas always pop into mind especially during periods of enforced periods of inactivity. One of these ideas has been confirmed as a mini project for this year. In our bathroom we have a large bowl of pot pourri the contents of which really need replacing. I'm going to need quite a lot of dried material to fill the pot to a level that doesn't look mean and ridiculous. The container is the size of a smallish old fashioned chamber pot. For those of you who have never heard of a chamber pot - suffice it to say that in the past it was placed under the bed so that a night there was no need to venture outside to the outdoor facilities. These receptacles were often very ornate especially when belonging to the wealthy. Thankfully my pot wasn't one designed for actual use. Anyway back to my project. I would have needed to buy quite a few packs of pot pourri and then the light bulb flashed on in my mind - why not grow some suitable flowers and make my own pot pourri? Now I just need to decide which type of flowers would be suitable to grow. I want to stick to annuals or use perennials that I already grow. We don't have an airing cupboard so I need a different method of drying - something simple. So far I am thinking poppy seed heads, nigella, helichrysum, lavender, maybe grass seed heads and small pine cones. 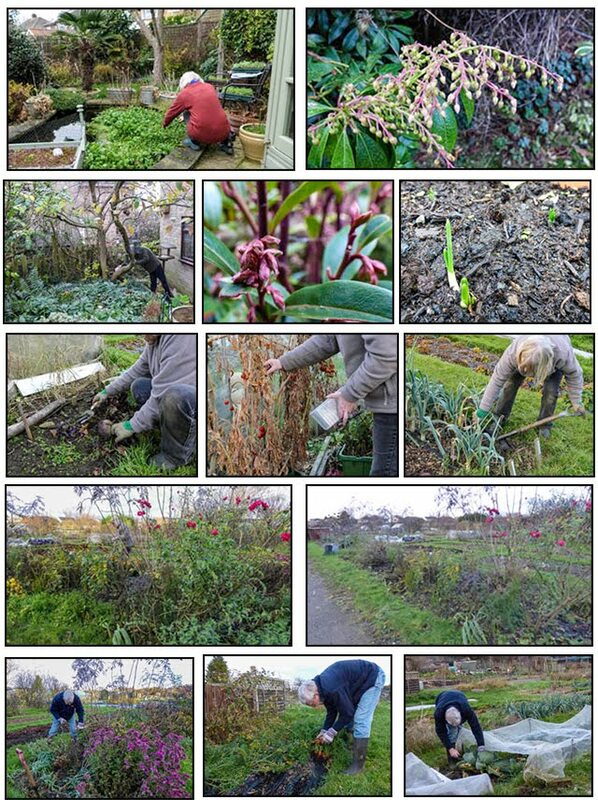 We managed just one visit to the plot last week. It was on New Year's Day and what better way to celebrate the new year than to pick a few fresh vegetables to see us through the week. The harvest was pretty much as you would expect at this time of the year - no surprises this time. We were happy to see some more large parsnips - the roots are so long that they tend to snap and leave their tails behind them - a bit like Little Bo Peeps sheep. The only real disappointment is provided by the carrots. We keep hoping that the next harvest will be better but we are still lifting very misshapen, pest attacked specimens. I wonder whether the proximity of this bed to the compost heaps is providing a safe haven to slugs. If so we will have to think carefully about what we plant there this season. 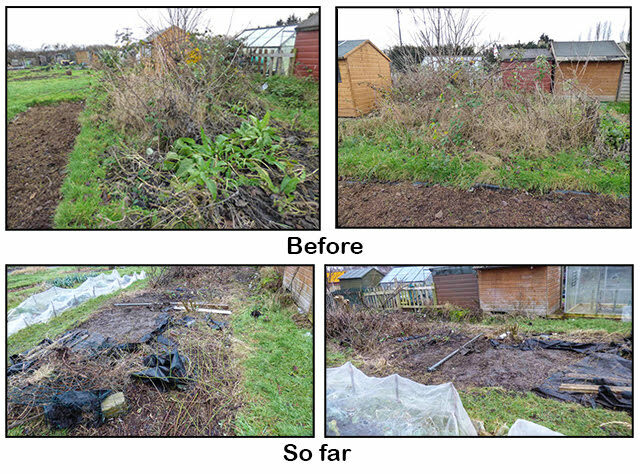 After harvesting we had a little time, before rain stopped play, to do some more work on some of the areas on the plot that have been earmarked for a face lift. Martyn, worked on a large area that has been neglected for several years. It had been covered with weed control fabric but after being neglected for so long the weeds had grown through making the task far more difficult. There is still work to be done but Martyn is making good progress. I am tackling a much smaller area - which is only fair as I am much smaller. The end of one of our fruit tree beds was very messy, mainly due to it being almost impossible to remove couch grass from where it had woven itself around and in amongst a clump of rhubarb. The rhubarb needed digging out to enable me to tackle the clearance. I can't find a before photo but you can get some idea from where part of the messy area is visible at the end of the bed in the photo below. 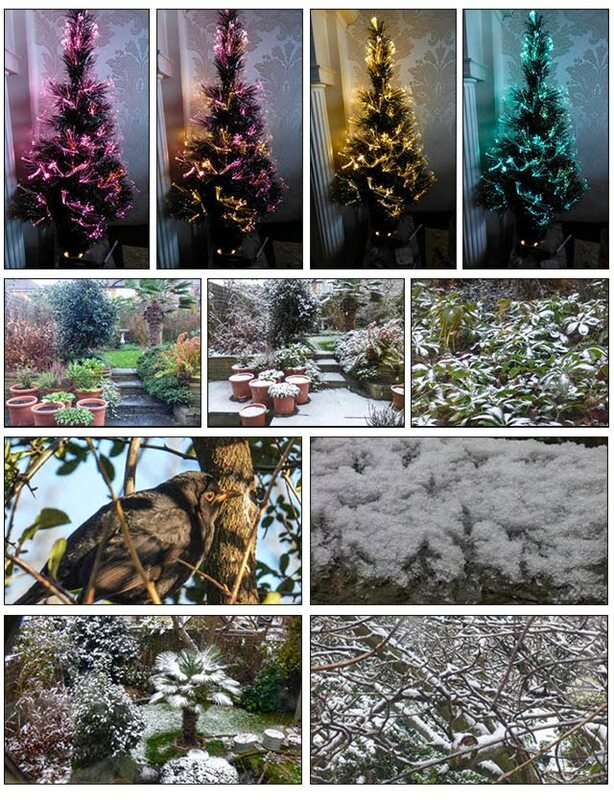 The photos below show the state of play so far. Not as dramatic as Martyn's achievements but no less overdue. As the rhubarb was lifted I noticed that it was beginning to produce new shoots. No doubt being wrenched from the soil and chipped in half will have set it back but fortunately we have clumps elsewhere that are also producing new growth. Not quite rhubarb crumble stage yet but it's a welcome sign that the new season has begun. Again Martyn produced a video of our New Year's Day activity which, if you are interested, can be viewed here.